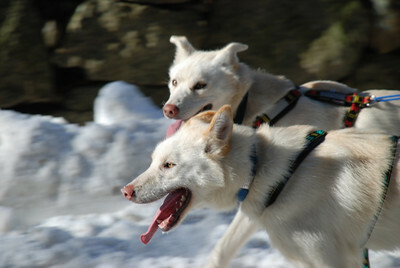 Just last week I had heard via Twitter that there would be sled dog races taking place in South Hamilton. Interested in this unique type of event, I made plans with the family to head up and see them. On Saturday we drove up to South Hamilton for the 9am start of the race, and found a parking spot near one of the spectating points. 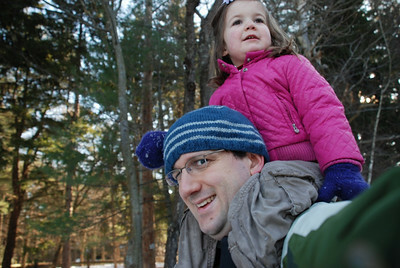 Catherine became busy in exploring the surrounding area, made friends with some other kids who were building tunnels in the snow, made some snow angels, and took some walks with me while we waited to see the dogs. We waited for a while, hanging near the volunteers who were getting updates on the progress of the race. It seems that the start of the first race was delayed. We watched as snowmobiles raced back and forth along the track, volunteers groomed and cleared snow, and some cross-country skiers came through. The crowd continued to grow as we waited. At long last (about an hour and a half after we arrived) the first dogs ran past! The first race was one with which we were unfamiliar, Skijoring. 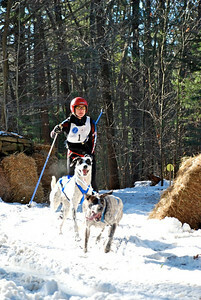 This race is essentially dog-assisted cross-country skiing. I was a bit surprised when they came around the corner and there was no sled. Since that was my only exposure to “sled dog racing,” that’s what I had been expecting. In any case, there were three or four competitors in the race, and they raced out past us and then came back. Some of the dogs raced wildly off the track, while others seemed a bit more controlled. By the time the Skijorn finished, the girls were getting pretty antsy and cold and hungry, and Rebecca had an appointment to keep, so we sadly had to depart the race. Perhaps next year the race won’t start quite as late, or maybe they could provide text messaging updates on the morning of the race as to when it was actually going to start. This entry was posted in Life Near Boston, Sports on January 18, 2010 by Peter. Today marks the start of the 2008 Summer Olympics in Beijing! Rebecca and I are always big fans of the Olympics, and although we’re not holding a massive Olympics party like we sometimes do, we will certainly be watching the opening ceremonies, as well as many of the events. In honor of the start of the Olympics, I thought I’d share a few photos from some of our previous Olympic adventures. Here are some from our visit to the US Olympic Training Center in Colorado Springs last summer. We had a while to wait, back then! You can view more photos from the Olympic Training Center. There are more photos from Montreal in the gallery. Finally, some photos from our last Olympics party, for the 2006 games in Torino. Flags of the Nations – each of the invitations had the flag of a different country. Hope you enjoy the Olympics! This entry was posted in Occasions, Sports on August 8, 2008 by Peter. Thanks to Jacoby Ellsbury of the [Red Sox](http://www.redsox.com/), on October 30 we scored three [free tacos at Taco Bell](http://mlb.mlb.com/mlb/fan_forum/tacobell/)! There was quite a lineup at the North Shore Mall’s Taco Bell location. See our Gallery for [more photos](http://prwdot.org/gallery2/v/events/2007/free_taco_day/)! This entry was posted in Food, Sports on November 2, 2007 by Peter. Sadly, it doesn’t look like Catherine’s team spirit has helped the Buckeyes this year. There’s always next season! This entry was posted in Baby, Sports on January 8, 2007 by Peter. Is it just me, or has anyone else noticed the glaring similarities between American speed skater, Shani Davis and “Incredibles” character Frozone? Davis is a fine skater, but all I can think about when he skates is Samuel Jackson’s voice yelling “where’s MY super suit?! ?” Teehee. Frozone Image Â© Disney Enterprises, Inc./Pixar Animation Studios. Shani Davis Photo Copyright Â© Meijco van Velzen. This entry was posted in Sports on February 21, 2006 by Rebecca. Today marks the 109th running of the ***Boston Marathon|http://www.bostonmarathon.org/***. Becky’s uncle Tom is going to be running it again this year. Last year, Becky and I were able to take the day off and ***watch the Marathon|http://prwdot.org/archives/001727.html***, but this year we’ll be cheering Tom on from afar. If you’re interested in tracking Tom’s progress, you can go to the ***Boston Marathon|http://www.bostonmarathon.org/*** site once the race begins, and put in his bib number: 21485. Tom has passed the 10k mark and his pace is currently 8 minutes per mile. If he can keep it up, he’ll finish in about three hours and 30 minutes. Go Tom!! As of the 30k checkpoint, Tom was still right on the 8 minutes per mile pace, for a projected running time of 3 hours 30 minutes 54 seconds. That would put him finishing at around 3:40 PM. Keep up the good work!! Tom has completed the Marathon in 3 hours, 40 minutes, 35 seconds! His time last year was 4 hours, 8 minutes, 43 seconds – that’s nearly half an hour that he slashed off of his time. And he came in only 10 minutes later than the time he had hoped for. Congratulations Tom!! This entry was posted in Sports on April 18, 2005 by Peter. This entry was posted in Sports on February 7, 2005 by Peter.